After completing one of their successful cattle drives, Charles Goodnight, three of his cowboys and one mule headed back home in Texas. The mule was heavily packed with 3 days of provisions and twelve thousand dollars in gold, money they had received from their cattle sales. Each man rode a mule but they each also led their fastest horses… in case they needed to make a run for it. Along the way they ran into a ferocious storm. 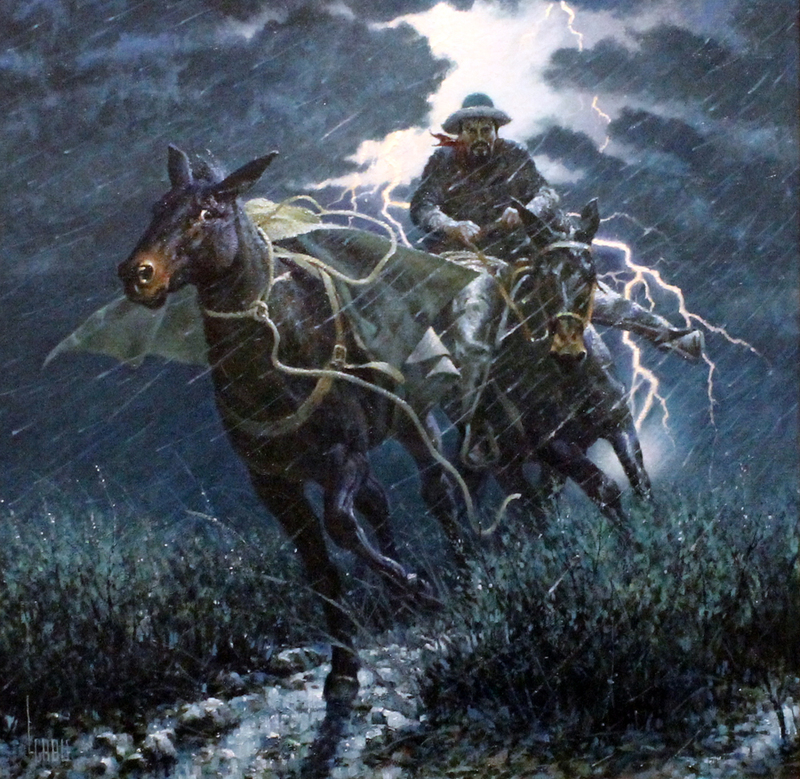 And at the height of the storm along the Pecos River, the pack mule with the gold panicked and bolted past Charles “like a bat out of a brush pile”. Spurring his saddle mule to the limit, Goodnight passed the runaway mule, flung himself off and grabbed the lead rope. He then hung on like a badger and worried the mule to a standstill. The gold was intact, but they’d lost all their supplies. This painting is an attempt to give shape to this adventure. Artist, Lee Cable, discussing this painting commented… In the preliminary working sketch, I hade a horse in background. It was distracting from the action. Having removed the horse warranted a different composition. Introduced an open path for the mule to draw the eye into the action. Lifted the mule’s head, changed the position of it’s leg and opened up the pack to create more movement. The Life & Times of Charles Goodnight opens at the Bryan Museum in Galveston, Texas, and runs from June 21st – October 22nd. Read More about Charles Goodnight and this fabulous exhibition.